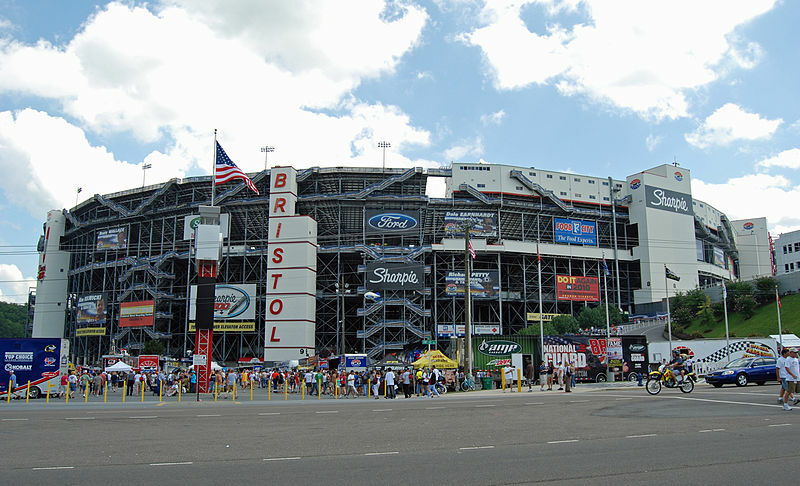 Home Travel Could Bristol Motor Speedway Ever Host a Super Bowl? In 2005, Bristol Motor Speedway owner Bruton Smith made a public offer of $20 million apiece to the University of Tennessee and Virginia Tech to schedule a non-conference college football game between the two teams inside the speedway’s racetrack. Though the Hokies were quick to welcome such a proposal, the Volunteers were more reluctant. Eight years later, on October 14, 2013, after years of negotiating, Virginia Tech, University of Tennessee and Bristol Motor Speedway announced plans for the game to be held on Saturday, September 10, 2016. The non-conference game, dubbed the “Battle at Bristol”, was college football’s highest attended ballgame with 156,900 people in attendance and served as one of the most ambitious feats in all of athletics, presenting incredible engineering challenges for the half-mile NASCAR track. But what if the Battle at Bristol was a trial run for something even bigger — say, like, a Super Bowl? The notion of small community of Bristol, Tennessee / Virginia, competing against cities such as Atlanta and New Orleans for an NFL Super Bowl may have been considered crazy talk not too long ago, but with NASCAR crowds disappearing faster than a toupee in a hurricane, the region is being forced to become more creative in order to bring back the crowds it saw in the glory days of Earnhardt, Wallace and Allison. Undoubtedly, a lot of improvements would have to be made in order for the track and the community to be ready for a Super Bowl game, but the +500,000 resident metro area has the capacity to host events of this caliber – they’ve been doing it twice a year since the “World’s Fastest Half Mile” opened in 1961. Not only does the area have the capacity and vision to support such a massive undertaking, but they also have one thing that so many other places do not – someone like Bruton Smith who is willing to think outside of the box and do things very few believe is even possible. Granted, it was a preseason game in 1961, but Bristol Motor Speedway has already hosted an NFL matchup between the Washington Redskins and Philadelphia Eagles. The locations of Super Bowl games are chosen by the NFL well in advance, usually three to five years before the game. Cities place bids to host a Super Bowl and are evaluated in terms of stadium renovation and their ability to host. Stadium must have a minimum of 70,000 seats… BMS has 150,000. Stadium must have the media and electrical amenities necessary to produce the Super Bowl… which they do. There must be a minimum of 35,000 parking spaces within one mile of the stadium. Two things that may hurt a Bristol bid, however, are the requirements of the game being played in a media market that has an NFL team and stadiums where the average game day temperature is below 50° Fahrenheit must either have a roof, or a waiver given by the league. Though a Bristol, Tennessee, Super Bowl bid would be a difficult challenge, it would not be an impossible undertaking, as waivers may be issued concerning all of the requirements. Also, the +150,000 capacity stadium would have the ability to break the NFL’s most attended Super Bowl game’s record by more than 46,000 people. Imagine how huge it would be for the league to provide that many additional opportunities to create lifelong fans and put butts in the stands! In 2007, NFL commissioner Roger Goodell suggested that a Super Bowl might one day be played in London – a clear sign that the league is willing to think outside of the box when it comes to hosting a Super Bowl game… and what is more outside of the box than inside a 150,000 capacity NASCAR racetrack? To be clear, neither the speedway nor the city has publicly indicated their desire to host a Super Bowl, but one can’t help but imagine such an undertaking is exactly in line with precisely the type of challenge a NASCAR racetrack undertook some thirteen years ago when it set out to host the largest college football game ever played.